Notes act as a significant role to give us a hand to remember things that are urgent, important or memorable, and at the same time record specific date & place. But, everything will turn to ashes, unfortunately, owing to improper operation or mistaken deletion. Hope is that the created iPhone backup with iTunes can get you out of trouble efficiently. Still have no idea? 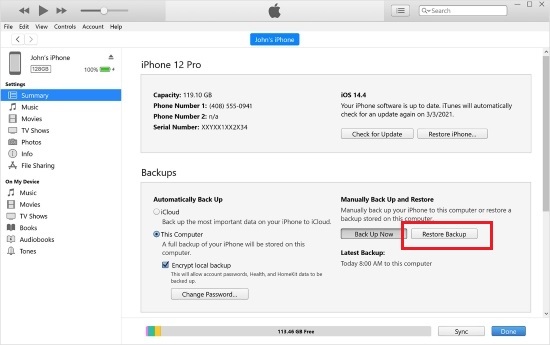 Let's talk about how to recover notes from iPhone backup in details now. 1. Go to "Recently Deleted" folder on your iPhone "Notes" app to see whether there are useful notes you'd like to undelete. Do it as early as possible considering this folder is only available for 30 days, or up to 40 days. Thus, all deleted notes will be permanently removed after the deadline. 2. Don't sync iPhone with iTunes after your lost or deleted your notes, which will update iTunes backup to the latest one and overwrite the previous one, leading to no chance can be gotten to restore possible notes files from iTunes. 3. Stop making further operations on your iPhone, such as installing new app, download online files, etc. It will easily overwrite your deleted notes. iTunes proved to be a great tool for backing up iPhone data, with which Apple users can execute syncing data in automatical or manual manner. Anyone who is familiar with iTunes must be clear about that there is a forthright "Restore Backup" option well designed on iTunes. Next we are going to show you how to make full use of this function at every step. Step 2: Tap on the iPhone device symbol after iTunes recognizes iPhone successfully. Go for "Summary" > "Backups" > "Manually Back Up and Restore" > "Restore Backup". Or head to "File" > "Devices" > "Restore from Backup". Step 3: Simply press on "Restore Backup" button to start to retrieve iTunes backup. Remember to keep iPhone connected with before iPhone data is completely restored. Note: This solution has obvious shortcomings. Firstly, the current data saved on your iPhone will be replaced with the restored iTunes backup. Secondly, no selective option is developed to exactly choose deleted notes for recovery. You will be aware of the importance of a dedicated iPhone backup extractor, therefore, which can perform as a medium to prevent existing data being damaged, lost or overwritten. Most essentially, it can take all synced iTunes backups for your reference and is ideal to selectively recover needed iPhone notes rather than the whole backup file, which, to a large extent, economizes large amounts of time. 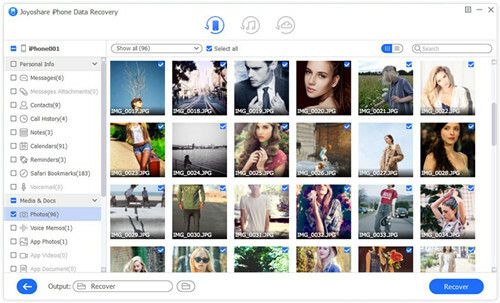 Among a wide range of data recovery tools in market, Joyoshare iPhone Data Recovery can perfectly live up to your expectations. Compared to its rivals, it comes with amazing searching and recovering speed. Best of all, not only notes, but also more 20 kinds of iOS data, such as photos, reminders, Safari bookmarks, WhatsApp/Viber/Kik messages, contacts, videos, etc. can be supported without hassle. 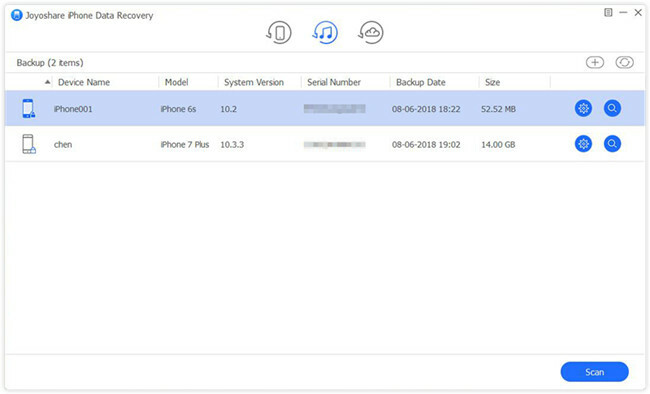 Get Joyoshare iPhone Data Recovery launched on computer and navigate to the top menu bar to switch mode to "Recover from iTunes". This program will automatically detect and recognize all synced iTunes backups from local folders. Pick up the most relevant iTunes backup you create before. It should have the biggest possibility to contain deleted iPhone notes. Afterwards, continue to hit the "gear" icon behind it to select data types. 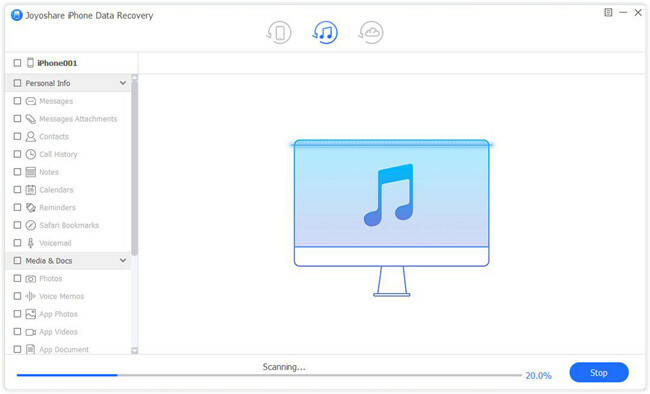 Mark "Notes & Attachments" and click "Scan" button to initiate a scanning task. Soon after, Joyoshare iPhone Data Recovery will finish scanning iTunes backup and display recoverable notes in your sight. You can choose "Only show the deleted" setting and press the "Recover" button to export all ticked items to computer.